While Android is, perhaps, the most feature-rich mobile operating system in the market today, it does not, at all, offer the best possible user-experience*. There are plenty, plenty of small things, petty things that eventually add up to an inconsistent, not-so-well-thought-out experience. I could go on forever about the little things that annoy me on a daily basis, but that would be quite tedious, especially when folks like thoomfish over on Reddit have already talked about a few. I came across a very useful tweak recently. It’s a tweak many Android device owners will appreciate since it solves a problem they probably face on a daily level. Check it out after the jump! One of the many small things that add up to a not-so-engaging experience on Android is the fact that when you hold the volume down button to silent your phone, this only silences the ringer. This means that only incoming phone calls and notifications are muted, while media volume (the setting which determines the volume of sound coming from apps) remains the same. This became an annoying issue for me recently. I have this boring class every week in which I try to focus but eventually end up flipping out my phone to watch cats do funny stuff on YouTube. This one time, when my ringer volume was muted, I launched a video and, lo and behold, before I could mute the media volume, the teacher heard the video and, well, don’t ask me what happened next. 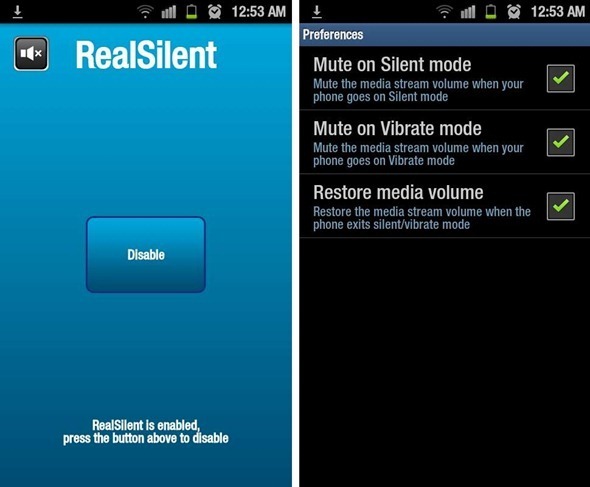 Anyway, RealSilent for Android – developed by Daniel Velazco (the same person behind Tinfoil for Facebook) – does what it says: it actually silences your phone when you mute the ringer volume. So next time you silence ringer volume, your media volume will be silenced automatically**! Battery-friendly background app that will automatically mute the media volume on your phone when you change the ringer to silent. *Let me get this out of the way: I am a platform-agnostic smartphone enthusiast. I like both Android and iOS and I appreciate both their strengths and weaknesses. Currently a happy, satisfied owner of the Samsung Galaxy S II, will own an iPhone next.